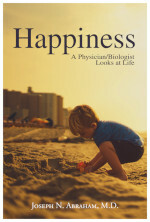 NB: Today I begin serializing my book, Happiness: A Physician/Biologist Looks at Life. To see the table of contents, click here. Subsequent posts will appear on Wednesdays. At some point, I will offer hard copies and eBooks for sale, but that may take a few weeks to get in place. Enjoy! 1. The game does not start later; it started when you were born. Despite what others may tell you, you have not missed much of what life has to offer. 2. You have a playing piece, called a ‘body.’ Some bodies are much nicer than others, but time will change that. Note that it’s the only body you will get. You may want to take an interest in it. 3. You will die. So will everyone else. Worrying about death doesn’t prolong life a bit, but it does make life less enjoyable. 4. The game is called ‘learning,’ but many people prefer to call it ‘life.’ You can choose to enjoy learning, and to enjoy life, or you can choose to hate them both. Either way, it won’t change anything but you. 5. Learning is a hit-or-miss process. There are no right or wrong choices, only pleasant and unpleasant outcomes. You may want to pay attention. 6. If you learn a lesson, you get a prize: a new lesson. If you fail to learn a lesson, you still get a prize: the same lesson repeated at a later date. 7. You have learned that there are good people, who are similar to you, and bad people, who are different. They are all similar to you. In fact, they are you. Again, you may want to pay attention. 8. Changing your situation won’t change you, and it won’t change the lessons. If you change anything except yourself, the lessons will follow you, and you will be no happier — nor unhappier — than you were before you changed things. 9. You will not get what you want most until you don’t want it anymore. This is to help you learn to enjoy what you already have, so that when you get what you want most, you will enjoy that, too. 10. There is no manual. When you’re stuck, sit quietly and ask what the lesson is. The answer will appear shortly thereafter. 11. A couple of hints: smell the roses, and learn to like the other participants. 12. You will forget all of this. Partly based on ideas from “Rules for Being Human” by Chérie Carter-Scott, Ph.D.
Beach Baby courtesy of taniadimas on Pixabay. Enjoy it, they will not last forever. If going wrong don’t worry , they can’t last long either. The first rule of surgery: All bleeding stops. In one of the courses my company sent me to, the instructor asked the class a very simple question at the beginning of the class: “What is it that you HAVE to do?”. Answer after answer was given, and he firmly said “No, you are wrong.” to every one. “I have to go to work”. No. “I have to take care of my kids.” No. Finally, someone gave the one and only correct response: “I have to die”. CORRECT, shouted the instructor. Folks disagreed, going back to their answers to explain why they HAD to do those things. The instructor kindly pointed out that they were all things we SHOULD want to do, but we do not HAVE to do them. Naturally, he pointed out, there are CONSEQUENCES to not doing these things. The entire point of the exercise was to get people out of the mindset that they are trapped in the situation they find themselves in. Interestingly, several people left the company within a couple of months after this class. They realized that they were not happy with their jobs, and decided to make a change. Some just changed companies (and probably just moved their problems with them). However, several people made huge career changes. One went to medical school and became an internist. Another went back to school and got certification to teach. I talked to a couple of these folks a year or so later, and they were all much happier.